Angeles National Hole 2: One of several medium length par fives on this course where the driver can "cut the corner" that is guarded by bunker / trees to give a decent shot at recording a birdie. But, like 13 and 16, if the big driver misses their direction, the long hit can easily find the desert. The conservative play will make this hole a fairly straightforward par five. the green does has an upper right half and a lower left half separated by a tier. Interested in Other Golf Course Reviews??? Angeles National Hole 5: Surrounded by woodchips, this hole is visually unique. The drive most avoid the obvious hazard to the right and the best drive will get between the wood chips right and the bunkers left. From there, the approach is fairly straightforward to a decently flat putting surface. Angeles National Hole 6: This long par four features a straight drive requirement with trouble on either side (like most at Angeles National). The green is on the other side of the desert area and will reject shots that are too far short or right. It is also an undulating putting surface and a tough overall hole. 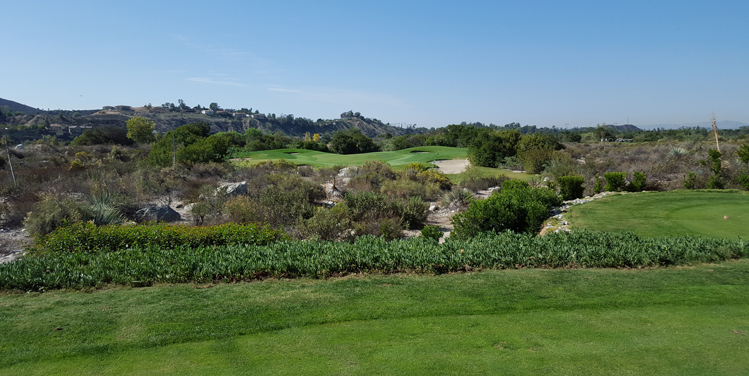 Angeles National Hole 8: The trouble on this par five is in the form of the water hazard that is hidden and in play for a big drive down the left. The player can lay up of that and have a very wide fairway, however. From there, the play is to stay right of the water on the second and the green is beyond it by quite a way. However, the putting surface is angles and protected by deep fronting bunkers, which means a full short iron will be best received. Angeles National Hole 9: The finish to the front nine is in the form of this very long par four. The drive can't go left into the bushes and, while there is more forgiveness right, there is more trouble over there too. The second shot must clear the wash and reach the green, ideally, which has some bunkers as well to avoid. Angeles National Hole 11: This short par four features a tight fairway, with bunkers on the left side. The green is sheltered by a deep fronting bunker and a downward slope to its left and right. The enterprising player can try to drive the green or aim a little left as that is the only area on the hole that offers room for error. The right side of the hole is bordered by chaparral from tee to green. 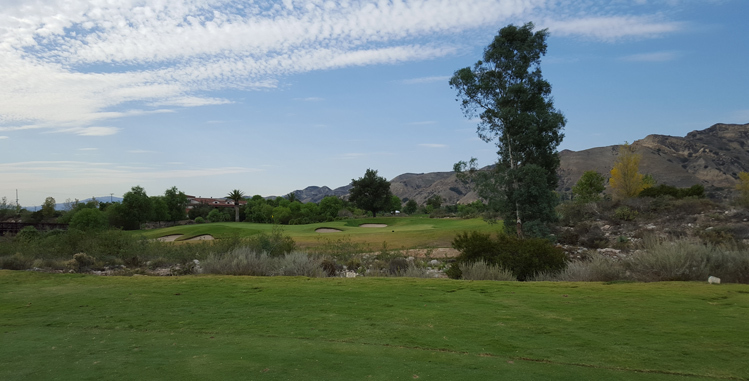 Angeles National Hole 12: This is the shortest par three on the course and it has a very long and narrow green. The high point of the green is in the middle, so any front pin can be seen well, but back pins are more difficult to judge. Going left, right or long leaves tricky up and downs. Angeles National Hole 17: This short dogleg right wraps itself around a huge, deep bunker, with the desert wash lurking even further to the right. The green is perilously perched between a deep fronting bunker to the left and the wash to the right and behind. The green is multi-tiered, and depending on the pin placement, the approach is easier from different sides of the fairway, so good hole planning is needed. Angeles National Hole 18: The finishing golf hole is an uphill par four that features one of only two true water hazards on the course. The drive must find its way between the bunkers and OB right and the creek to the left. The approach will then be to a large, undulating green with a lake short and left. There is plenty of bailout room to the right for the timid golfer (or for the golfer who hits a bad drive). More Los Angeles Area Golf Course Reviews.